Inflammation is a scary word. When it comes to your wedding day, the word inflammation is that much scarier. Inflammation is the body’s natural response to an injury or attack on the immune system. We most often associate surface inflammation with heat, pain, redness, and swelling. This is the kind of inflammation we can feel. Then there’s inflammation at the cellular level. What’s scary about this kind of inflammation is that we don’t necessarily feel or associate it with anything, but it is at the root of so many chronic issues including diabetes, heart disease, cancer, and more. There are a variety of things that play a role in our bodies inflammation levels including environmental factors, stress, injury, family history, diet, and more. However, there are also many steps we can take to decrease our risk. One of the easiest ways to start eliminating inflammation is by examining what we are putting into our bodies on a daily basis. Below are some of my favorite plant-strong meals to begin calming inflammation in one-day! Place all ingredients in a high-speed blender and blend until smooth and creamy! Top with bee pollen, optional. 1. De-stem the kale by making a claw like motion with your pointer and middle finger. Then clean the kale in a salad spinner or simply rinse and pat dry. 2. Little by little, place kale in a food processor and pulse until chopped. Make sure not to over chop so the kale doesn't become mushy! 3. Add in the nutritional yeast, sea salt, olive oil, and lemon juice. Then pulse again to combine. 4. 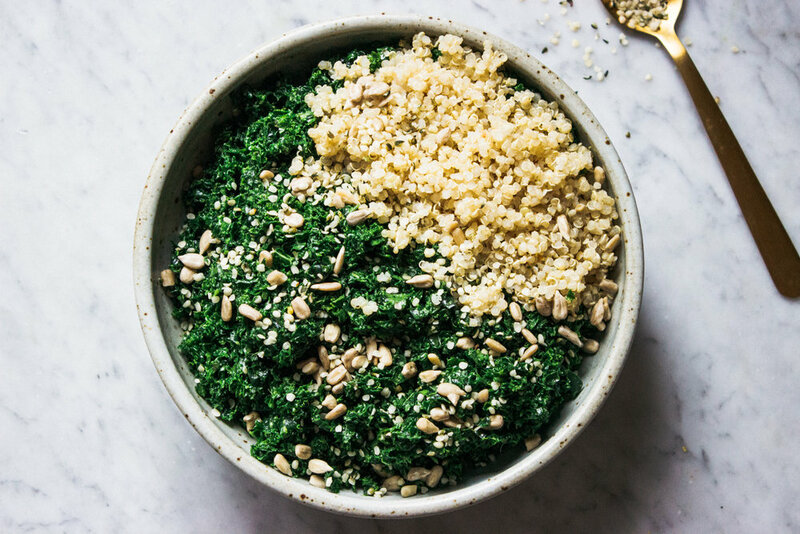 Remove kale from food processor and place into a bowl. Add in the nuts or seeds and legumes or quinoa* and mix together. *Because grains are acid forming, try adding a thumb-size strip of kombu seaweed to the pot of quinoa while it’s cooking. Once the quinoa is done, remove the strip of kombu. The quinoa will have soaked up all of the seaweed’s amazing nutrients making it a more alkaline grain. Kombu is high in iodine, which is essential for thyroid functioning, as well as iron, calcium, and vitamins A and C. Kombu can also be used when cooking beans. If you are someone who suffers from gas or bloating after eating beans but want to incorporate more of them into your diet, I recommend cooking beans from scratch and adding a strip of kombu. The seaweed helps to break down the raffinose sugars in beans, which is what causes gas. 1. Drizzle olive or coconut oil in a large pot over medium heat. Add minced garlic and ginger. Sauté for two minutes, stirring frequently. Then add onions and sauté for another 2-3 minutes. 2. Add chopped carrots and sweet potato, along with curry powder, cinnamon, turmeric, onion powder, sea salt, and black pepper. Stir and let cook for 2-3 minutes. Then pour in coconut milk, and vegetable broth and stir to combine. 3. Bring soup to a light boil then cover and reduce heat to low and let simmer for about 30-35 minutes or until vegetables are soft. 4. Using an immersion blender, or transferring soup to a blender (recommended), blend the soup until smooth and creamy. Taste and adjust seasonings as needed (I like to add an extra dash or two of each seasoning here and quickly blend again). 5. Add soup to a bowl and top with raw cashews or pumpkin seeds (optional). Cover leftovers and place in the fridge or freezer. Everyone knows that turmeric takes the vegan cake when it comes to calming inflammation. Enjoying a warm cup of Golden Mylk is one of my favorite ways to wind down at night. With it’s warming, grounding qualities, this anti-inflammatory powerhouse is the perfect addition to your already plant-strong day. Make a cup in the evening, or in the afternoon for a little calming snack! 1. Place all ingredients in a small saucepan and bring to a light boil. Reduce heat to low and simmer, whisking all ingredients together for up to 20 minutes. Pour into a mug and enjoy!